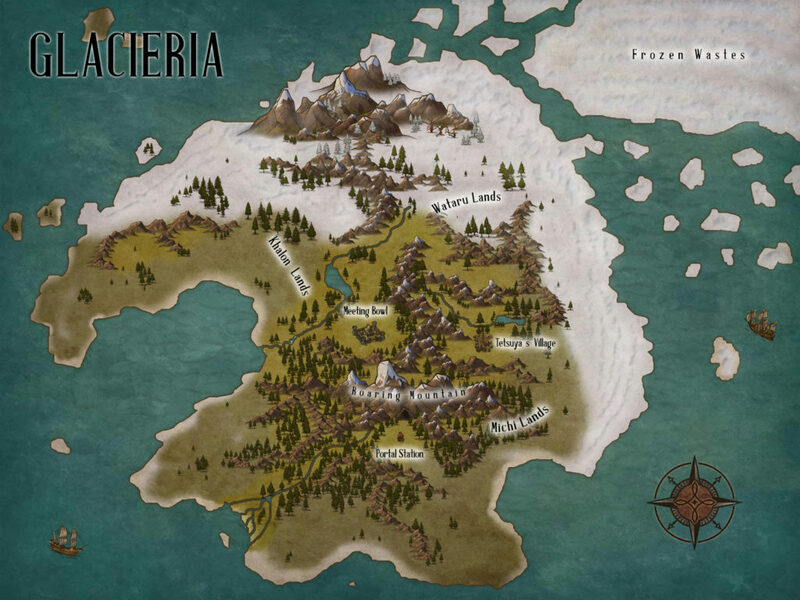 Glacieria, also known as the ice world in this epic fantasy book series, is a place where deep winter holds sway most of the year. The inhabitants are hearty and take pride in surviving the harsh conditions. Festivals within the tribes (extended family units) or between competing tribes are common occurrences. Dog sled racing and feats of unarmed martial arts dominate these celebrations. Three main tribes have divided the land into distinct areas. The Khalon tribe, most war-like of the three, claim the western lands, the Wataru claim the more mountainous north-east portion of the continent, while the most peaceful of the three, the Michi, lay claim to the south- eastern section of the continent. Though historically the skipping line portal was controlled by the Michi, recent upheaval has transferred control of the portal to a cooperative effort of the Khalon and Wataru tribes, while the Michi have been driven from the area surrounding the portal station. Glacieria is magic saturated and pockets of heavy magic can be found in various locations, especially in caves warmed by underground rivers of molten rock where the air is dense, and energy abounds.